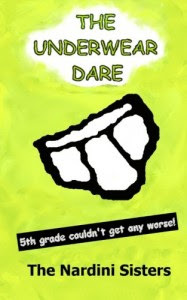 The Underwear Dare fills a void for children who are reluctant readers by engaging them with the gross-out humor that kids love. It tells the tale of two fifth graders, nerdy Josh and Eddie, the school bully. They become stepbrothers and concoct a series of dares to decide who gets to move into the newly refurbished attic room. The Underwear Dare takes on universal themes such as bullying, blended families and friendship but in a fast-paced, funny way that is relatable to children. Florida resident and her sister penned this topical novel. Lisa Nardini, a former children’s librarian, now flight attendant co-wrote the novel with her sister Gina, an elementary school teacher. Lisa and Gina wanted to create a humorous book that children would want to read, especially boys. Lisa lives in Suntree, Florida and her sister, Gina, lives in Julian, North Carolina. Be sure to read the wonderful reviews you'll find there and another at I Got Mom Power. The I Got Mom Power website is also having a giveaway. You just might win a copy of The Underwear Dare over there.